The Gemara further records that the Yeshiva of Rebi relied upon this beraissa to interrupt their study of Torah in order to hear the Megillah. They reasoned, if the avodah, which is stringent, must be abandoned for Megillah reading, then it is certainly true that Torah study, which is not as stringent, should be abandoned as well2. The Shulchan Aruch3 codifies the ruling that we interrupt Torah study to go hear the Megillah and adds that all the more so one must disrupt any mitzvah one is engaged in in order to hear the Megillah. At first glance this halacha is difficult to understand. Why does the Gemara refer to interrupting the study of Torah in order to hear the Megillah as “bitul Torah” In what manner is the study of Torah being interrupted if listening to Megilah is inherently Talmud Torah, as it is part of Tanach? There are a number of approaches in the Acharonim to answer this question. The Aruch HaShulchan writes4 that indeed hearing the Megillah itself is full-fledged Talmud Torah but it is the time that is wasted in getting the people together until the actual reading begins which is considered bitul Torah5. However, there are a number of other approaches that highlight a fundamental difference between the Torah that one is engaged in when hearing the Megillah and other types of Torah learning. One approach is that in addition to the idea that ceasing to learn for a mundane activity is considered quantitative bitul Torah, there is also a concept of qualitative bitul Torah in which one could have learned in a more in depth manner but chooses instead to learn Torah on a more superficial level. This concept is stressed in Shulchan Aruch HaRav6 who codifies that it is wrong for one to actively choose to engage in Torah learning that it is easier instead of tackling a new complicated topic7. Based on this concept we can understand the nuance of the Yeshiva of Rebi establishing that one must interrupt their study of Torah in order to hear the Megillah. Without this ruling, one would have thought that to go from intense study of Torah to hearing the Megillah would be a violation of qualitative bitul Torah. Other Acharonim suggest a different approach to this issue. 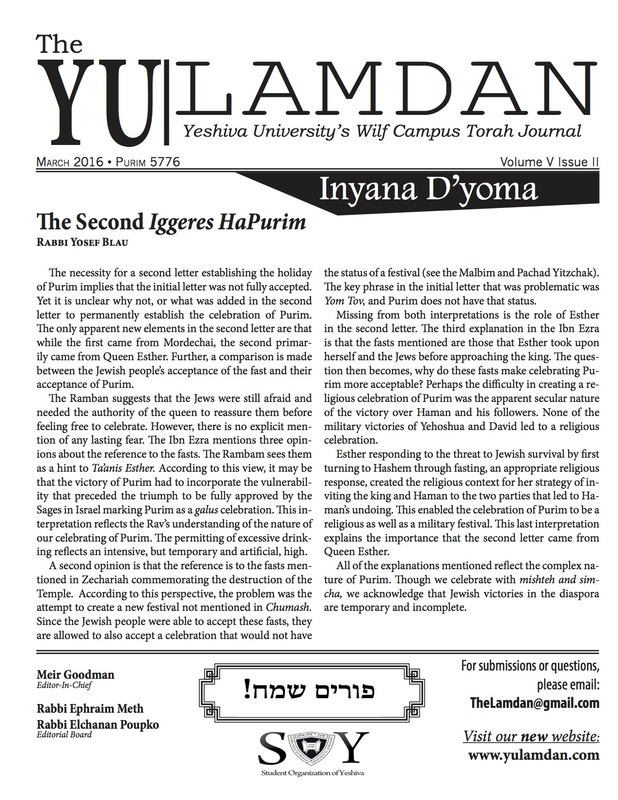 The Rambam8 writes that the study of Torah is equivalent to the performance of all other mitzvos since through learning Torah, one’s overall fulfillment of mitzvos will be enhanced. The Rambam writes that if while one is engaged in learning Torah and there arises the ability to do a mitzvah that no other person can fulfill, then one must stop their learning in order to fulfill that mitzvah. Based on this Rambam, the Ohr Sameach9 raises a difficulty with a ruling in the Gemara. The Gemara10 states that ha’osek be’mitzvah patur min ha’mitzvah, one who is engaged in the performance of a mitzvah is exempt from fulfilling other mitzvos. This rule even exempts one who is walking to do a mitzvah from fulfilling the mitzvah of sitting in a Sukkah. The Gemara gives an example of such a case: Rav Chisda and Rabbah bar Rav Huna were exempt from sitting in a Sukkah since they were traveling to learn Torah from the Reish Galusah. According to the Rambam’s ruling that one who is engaged in Talmud Torah is not exempt from any mitzvah which only they can perform, this Gemara is difficult to understand. How can these Amoraim who were simply walking to learn Torah be exempt from the mitzvah of Sukkah? The Ohr Sameach answers this question based on a principle formulated by Tosafos. Tosafos11 records that when R’ Akiva began to learn before Talmidei Chachamim, he interrupted his Torah study in order to go bury a meis mitzvah. R’ Yehoshua criticized R’ Akiva for the bitul Torah caused by engaging in such activity. Tosafos asks that this episode seems to contradict the ruling in the Gemara12 that one should interrupt their Torah study in order to bury a dead body. Tosafos answers that R’ Yehoshua was not criticizing R’ Akiva for ceasing from his Talmud Torah but rather for ceasing from his shimush Talmidei Chachamim, and one who is engaged in shimush Talmidei Chachamim should never interrupt that for the mitzvah of burying the dead since gadol shimusha yoser m’limuda, it is greater to be involved in shimush Talmidei Chachamim than actual Torah study. What is the definition of shimush Talmidei Chachamim? The Gemara13 says that even if one has learned Torah they are still considered an am ha’aretz if they do not engage in shimush of a Talmid Chochom. Rashi explains that this is referring to engaging in group Torah study with masters of Torah in which the logic and reasoning behind the halachos are explained. As R’ Akiva had just began his study of Torah and was developing his skills of reason and understanding from his teachers, it would have been inappropriate for him to interrupt this foundational learning period for any mitzvah whatsoever. Based on this answer of Tosafos, the Ohr Sameach explains that R’ Chisdah and R’ Hunah were exempt from fulfilling the mitzvah of Sukkah since they were not merely going to study Torah but rather they were going to be involved in shimush Talmidei Chachamim through hearing and discussing Torah with their teacher. This concept can also explain for why it was innovative for the Yeshiva of Rebbi to interrupt their study of Torah to go hear the Megillah. A yeshiva is not simply of place where people learn Torah but it is a place where students actively engage in discussion regarding the reasoning of the halachos and are learning from their teachers how to properly study Torah. They were involved in shimush Talmidei Chachamim. Therefore, without a specific ruling, it would have been inappropriate for the students to interrupt their learning to go and hear the Megillah. 7 See Medrash Rabbah Mishlei (12) for further elaboration of the severity of one who does not seek to advance their Torah Study. See also Moadim U’Zmanim Vol. 2 169 for on the distinction between hearing the Megillah and other forms of Talmud Torah.